I was interviewed for Elizabeth’s homework! I think she’s going to be an excellent journalist. 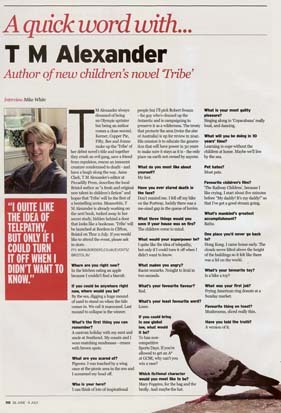 T M Alexander a children’s writer of the Tribe series. 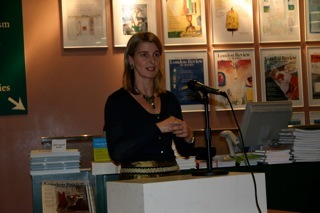 T M Alexander started to write her books in 2005. She went to a writing class and she really liked it and then wrote her first book. She has written 8 books but only 4 have been published. 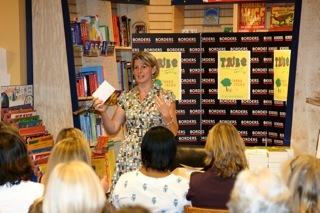 Enid Blyton was the person who inspired her to write the books that she wrote. The Twilight stories and Holes are children’s books that she likes. 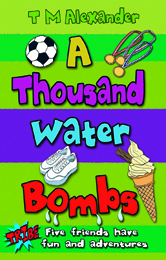 T M Alexander loves being an author because she can make everything up in her head. She writes in a hidden away room in her house in Bristol. T M Alexander says that she is 48. She has a handsome husband and they have 3 children. T M Alexander is easier to spell than her real name which is a closely guarded secret . . .
To the undoubted magic of the Tribe! 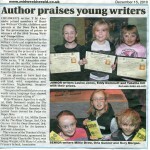 A piece in the local paper about the short story competition for children ……. Click on the newspaper cutting to read the complete article and find out the ten winners who received a prize for their work. 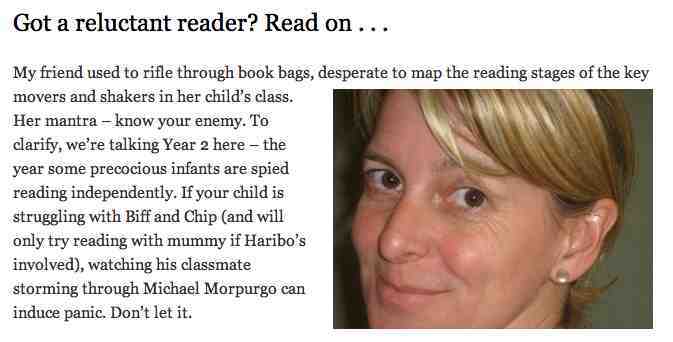 Thought I’d post a link to my first ever guest blog on netmums. Click to read the complete blog. Once upon a time, books about school friendships were a commonplace. But in these days when ‘high concept’ is a mantra in the publishing industry, books about ordinary children in real-life situations have become something of a rarity. Series fiction, however, can occasionally offer the younger reader a break from a steady diet of protagonists with special powers and/or an affliction of zombies, vampires or fairies. 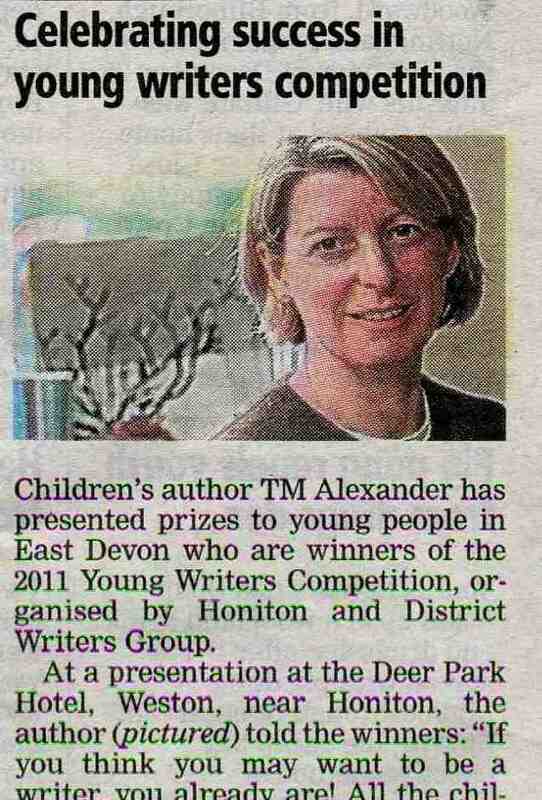 In addition, T. M. Alexander has succeeded in creating a series for 8-12 year olds which appeals across gender lines. 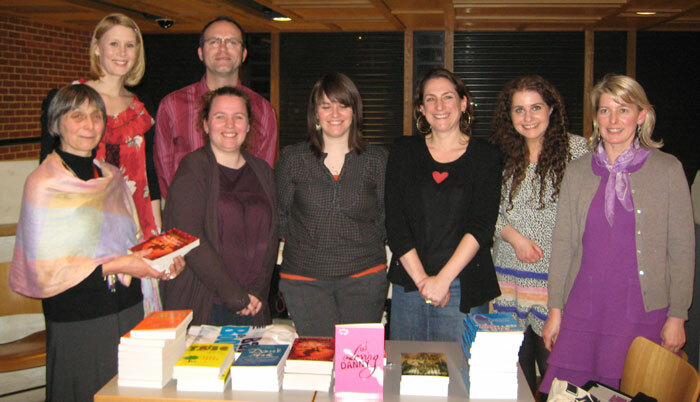 The Tribe is neither blue or pink; it is merely witty, well-written and positive. Here is a writer who enjoys exploring the wonders and disasters real life holds for real children, and who allows her readers to do the same. 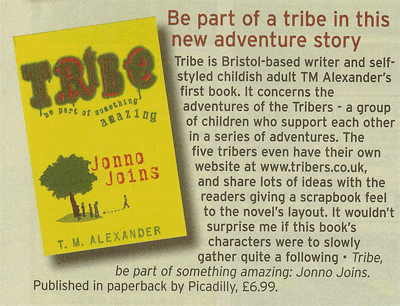 My son and I were introduced to The Tribe in 2010 with the publication of the first book in the series: Jonno Joins. My then 13 year old swallowed Jonno in one sitting, and had very positive things to say about the humour and characterisation. 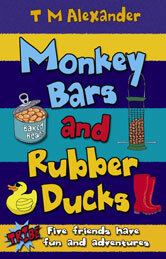 We’ve gone on to enjoy the subsequent titles: Goodbye Copper Pie, Labradoodle on the Loose and now the fourth instalment: Monkey Bars and Rubber Ducks. The books are episodic in content and narrated in first person by one of the four Tribe members, Keener. Alexander is spot on with the voice, worries and preoccupations of a ten year old boy. She cleverly incorporates lists and diagrams in the books, sprinkling humour or World Record-like information throughout the text. This lightens the whole and breaks the text into easily digestible chunks. Instead of affliction at the (dead) hands of zombies and vampires, Keener and his friends – Jonno, Copper Pie, Fifty and Bee – suffer lost dogs, school bullies, scary head teachers and tiresome siblings. The adventures are on the mild, rather than the wild side, but they are engrossing nonetheless, and the reader enjoys spending time with the five very different members of the Tribe. The heart of the books is an exploration of the importance of friendship, but also finding individual identity within a friendship group. Recommended for boys and girls aged 8 to 12. Five friends known collectively as Tribe have fun and adventures in their everyday lives together. Bee’s Labradoodle goes missing while Keener gets very involved in mountainboarding and forgets he is looking after Doodle, sparking a huge search for the dog. 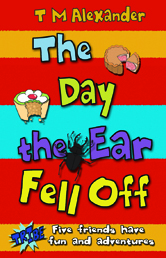 Bee then has a rather unusual birthday celebration and finally the Tribers face a difficult dilemma when the person they like the least at school is falsely accused of wrong-doing. This super book, the latest in the Tribe series, clearly shows the true value of family and friends. 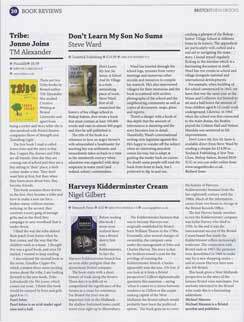 Thank you to Pearl Johns who reviewed the first two Tribe books for Bristol’s quarterly books magazine. 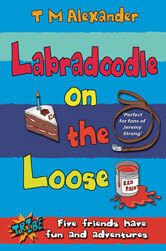 She came to the launch of the third book, Labradoodle on the Loose, and gave her verdict on that one too. Luckily it was positive. 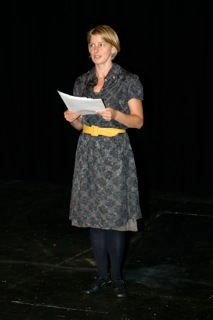 I was delighted to be asked to judge the competition for the second year. The children, like their stories, were charming and often funny. The writers’ group is a joy and I have enjoyed meeting the members and sharing lovely food at the Deer Park Hotel. A really enjoyable evening. My thanks to the organiser, John Carter, who is by the way, a lovely man, a farmer, a writer about foxes, and a big smiler. I had a great time in the tented city in glorious weather – almost too hot to run a workshop with 30 children (and some parents) as part of Hay Fever, the programme of activities designed for children. 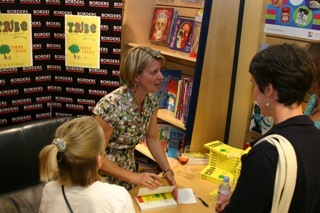 TRIBE: Jonno Joins has won the 2010 Hull Children’s Book Award. 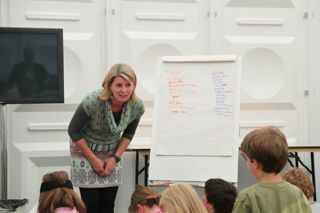 The winning book is voted for by the children after reading the five shortlisted books. I am planning a trip to collect the award in July. I was in the studio with Jude Merrill, Artistic Director, being interviewed by Ali Vowles about Celebration, a performance of 18 monologues by Show of Strength and Travelling Light Theatre Company at the Create Centre, Bristol. These monologues were written by a combination of young writers and professionals and include two of mine, It’s My Party and Jessie, Gigsy and Me. 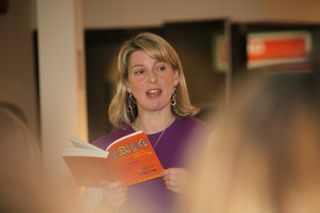 The launch of my second book in the Tribe series was held at View art gallery in Bristol on 24th March 2010. 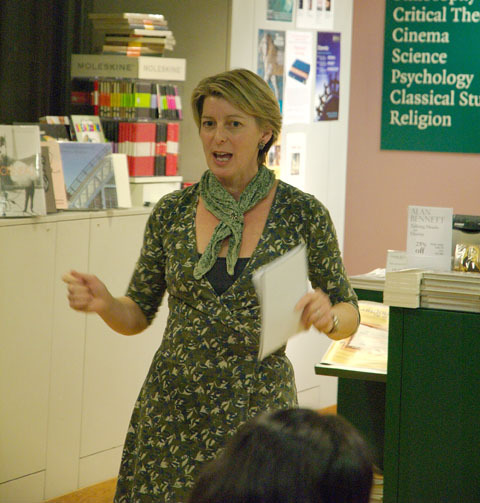 I had a lovely evening together with three other Picadilly Press authors talking to the London Youth Librarians Group (YLG) after their AGM at the historic Women’s Library in Aldgate. 1. The characters had weird and original nicknames. 2. They got into trouble. 3. They were a tribe not a gang. 4. Their personalities were awesome. 5. The book was imaginative and creative. 6. There was lovely description. 7. The characters were realistic. 8. The cakes sounded really nice! 9. All the little info boxes. 10. There will be more Tribe adventures to read about! Francesca Moses and Lauren White from St John’s School, Bristol made up this song after one of my storymaking workshops in October 2009. Andy Howard interview at 10.30am on 20th July 2009. Listen to the Andy Howard interview. David Clensy interview printed in Bristol Evening Post on 13th July 2009. Tribe found amongst books at Borders. 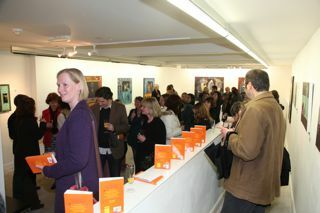 The launch was well attended, phew! 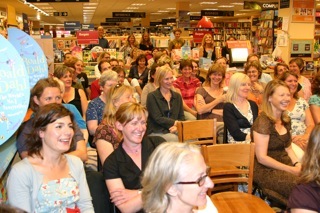 The staff at Borders were excellent. Ella and Georgia Comrie played their flutes, my children served the drinks, Rob took the photos, and much laughing was heard. 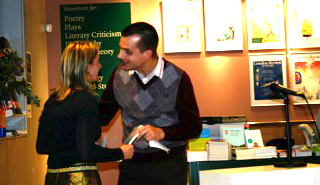 Collecting 1st prize for her short story SLEEPING LIONS, at the London Review Bookshop from Jason Arthur publishing Director of Heinemann, then editorial director of Vintage.